We imagine the pitch meeting went something like this: "C'mon dudes, it's a guy with pins in his head! It's funny! And it'll be even funnier if he comes to L.A.! What if we had him kill some bros by possessing a stack of CDs? That'd be dope, right?" 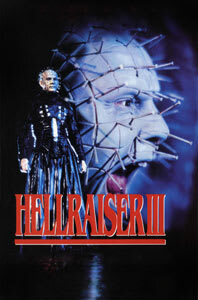 You can see the despair in Pinhead actor Doug Bradley's face as he must have known this was the end of any serious Hellraiser attempts.